With 29 Days Until The EU Referendum, on behalf of IG, new Survation polling shows “Remain” continues to have a steady lead over Leave in the latest telephone poll in our series. Full data tables for this polling including all questions asked and the methodology used can be viewed here. *For avoidance of confusion, Survation calculates +/- change based on unrounded decimal figures from poll to poll. 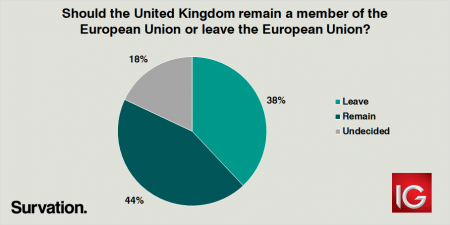 Survation’s polling this year has shown voting intention for Leave between 41% and 46% and Remain between 54% and 59% (excluding undecideds) – a consistent picture despite the Leave and Remain campaigns beginning in earnest during this period. 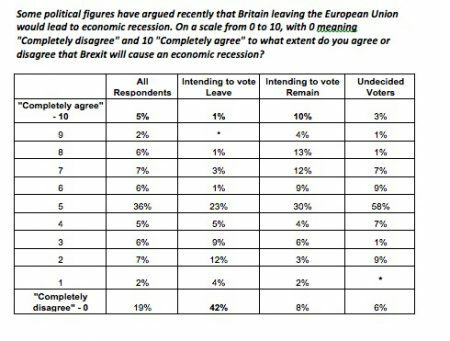 “In today’s polling for IG we also asked respondents to what extent they agreed or disagreed that Britain leaving the European Union would lead to an economic recession – comments that George Osborne and Prime Minister David Cameron made widely this week. The extent to which voters agreed with this assertion was revealing. Of those indicating that they would vote to Leave the EU, only 1% “completely agreed” with this statement compared to 10% of those indicating that they would vote to Remain, suggesting a reluctance on the part of all voters to be swayed by campaign messages. This may well explain the lack of movement in polling thus far. 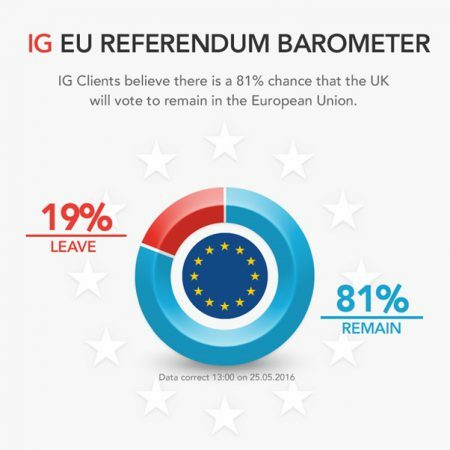 IG’s EU Referendum Barometer is currently showing an 81% chance that the UK will remain within the European Union, a new high for the Barometer since its launch in February 2016. A Brexit has been the most unlikely outcome since the inception of this market, according to IG clients. A vote to leave was given a 35.5% chance in March, before pulling back to just 19% today. The Barometer is an indicator of what those traders are predicting will happen in the 2016 UK referendum on membership of the European Union. The data is based on the political binary market IG has created for clients to trade on. Survation interviewed 1,013 adults aged 18+ across the UK including Northern Ireland on behalf of IG by telephone on 24th May. Established in 1974 as the world’s first financial spread betting firm, IG’s aim is to become the default choice for active traders globally. It is an award-winning multi-platform trading company, the world’s No.1 provider of CFDs* and a global leader in forex, and it now offers an execution-only stockbroking service in the UK, Ireland, Germany, Austria and the Netherlands. It is a member of the FTSE 250, with offices across Europe, Africa, Asia-Pacific, the Middle East and the US, where it offers limited risk derivatives contracts via the Nadex brand. *Based on revenue excluding FX, from published financial statements, September 2015. Rounded headline figures in this press release are based on the actual counts divided by the weighted number of respondents.